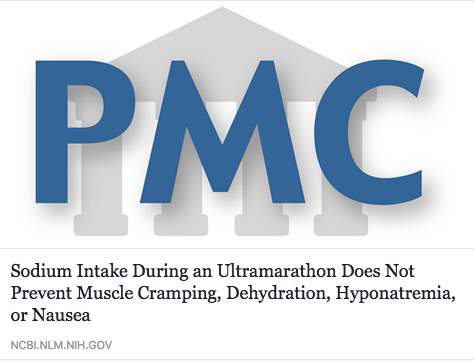 Ultramarathon runners commonly believe that sodium replacement is important for prevention of muscle cramping, dehydration, hyponatremia, and nausea during prolonged continuous exercise. The purpose of this study was to measure total sodium intake to determine if these beliefs are supported. Participants of a 161-km ultramarathon (air temperature reaching 39 °C) provided full dietary information during the race, underwent body weight measurements before and after the race, completed a post-race questionnaire about muscle cramping and nausea or vomiting during the race, and had post-race plasma sodium concentration measured.